A blog on Memorial Day Weekend? Why??? Why not just write it and bury it in the ground? (Cause the geocache’ers will find it and sign there own name and let the coordinates slip). No. This ones for me. And it’s about what to me equates to the best band Rock and Roll ever produced. And I’m clearly not seeking a consensus on this. Add the quirky twin to this soulful cyborg, a bass player capable of holding down, driving on, creating weird hooky high lines (his work on ‘This Years Girl’ still operates as ‘perfect bass’ to me), a perfect touch for a kiss or a stomp, the 4 string king of suburban soul, Bruce Thomas…. And lead by the scurrilous, scabrous bespectacled bard of longing and liking, skilled with abilities to weave syllables into fabric that can coat poor misunderstood boys and girls, to bright for their own goods. The slash and absolute-itude of rhythm guitars, the contorting emotional cannibal originally known as Declan but upgraded, evolved, promoted into royalty, Elvis Costello. Ladies and Gentlemen (meaning Jason), I introduce to you your favorite music if your not a dickweed, Elvis Costello and The Attractions. I don’t expect nor care if you agree. Based on all the bootlegs a boy can buy, this was an incredible and unmatched set of lads live. On fire isn’t enough. We need discuss the atomic to get even in the ball field. Live they combined punk fury fueled by the good ole’ days of cocaine, the beauty of listening to the appropriate amount of music from all over the planet, so the country is country, the soul is soul, the snozzleberries taste like snozzleberries. Wicked twists and turns of tight practiced over toured enthusiastic burning out and upwards. Let’s talk Long Player records. From ‘No Action’ to ‘I Want to Vanish’ that is decades of brilliant adult themed pop music. And each record has a different feel, a different sound, but is corralled by Elvis’s spit phrasing and Steve’s kooky carnival or sub classical leanings. When you consider that only 2 records separate ‘This Years Model’ with it’s pissed off youth fused punk rock pop to ‘Imperial Bedroom’, which is a different animal, big British, tribute laden by whatever drove the Little Hitler. But clearly the same species. And consider ‘Brutal Youth’ and ‘When I Was Cruel’ and recognize they not only held there own against the clock, but improved, fleshed out colour with visible brush strokes. While most bands that late into career would be hailed for still being relevant, The Attractions bent the bar into twisted shapes just to make it more interesting to hop over. And I include ‘Goodbye Cruel World’, considered one of their worst records. But still better than most other bands best. I speak of ‘Inch By Inch’ which is as perfect a tribute to online stalking as any, though written far before the Internet. ‘Worthless Thing’ with it’s accurate view of Rock and Roll myth making. ‘The Comedians’ just for that chorus (and yes, a better version was done by Roy Orbison). And the songs. Man, the songs. ‘I Want You’…epic and terrifying and beautiful. ‘Less Than Zero’… empty apathy deeply felt, perfectly rendered. OK, his perception of America was a little bit comic book, just like Bowie. But …why not? 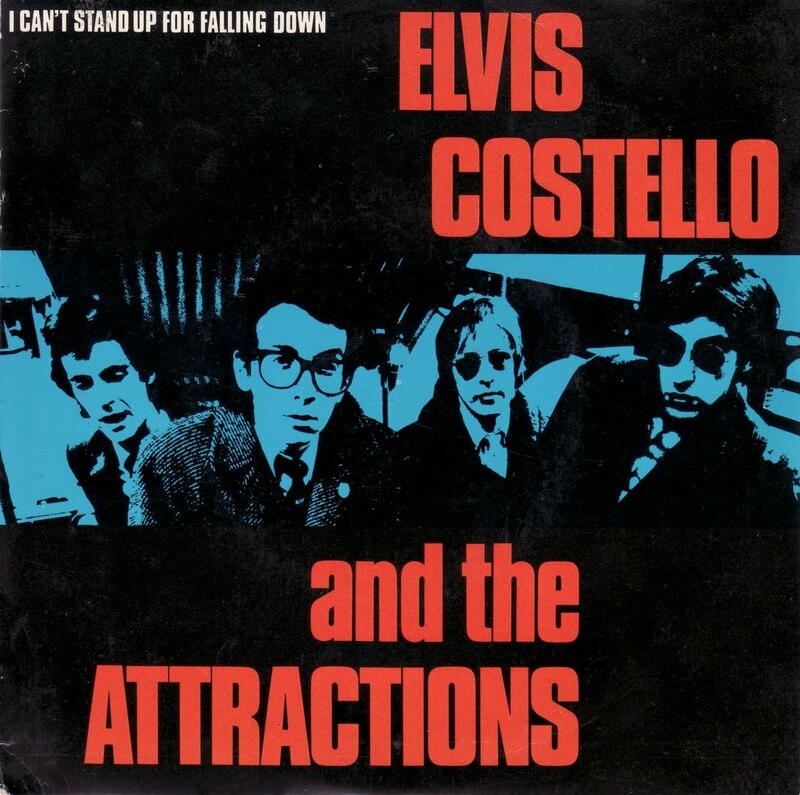 Elvis Costello was a provocateur. A major mensch. ‘Beyond Belief’… Jumps into the track from the first beat and spins the lyrics, the sheer volumes of syllables and imagery attached and a vibe that is unmistakeably Elvis. ‘Uncomplicated’….plodding, Goon Squad (oh yeah, and ‘Goon Squad’!!!) stomps in the room and lays you to waste, belittles your belief’s, your culture, your very DNA. In short, don’t break up with genius songwriters. ‘Night Rally’…specifically the existing footage from some long gone British pop show….my original VHS copy had weird distorted lines that ran down the left side…and based on the energy, the darkness, the fire that spilled out of every speaker and flickering tube, I miss that distorted stripe. It made this vision of a true warning of impending cataclysm and Nationalism seem like it was viewed in a loop in Anne Franks attic. Anyway. As you go about your BBQ’s and Parades, as you soak in that sun and soak down them suds (I guess), Remember Elvis And The Attractions. Or don’t.